Product prices and availability are accurate as of 2019-04-20 05:34:05 EDT and are subject to change. Any price and availability information displayed on http://www.amazon.com/ at the time of purchase will apply to the purchase of this product. Stunning UltraHD 4K (8-Megapixel / 3840x2160) resolution , 4K @15fps. Best in class low light capability utilizing the latest Sony Starvis image sensor and Ambarella S3LM chipset. 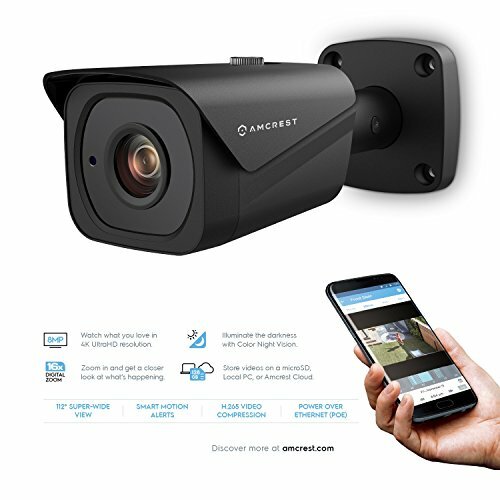 Playback and record professionally on a PC using the Amcrest Surveillance Pro for Windows and MAC (included) or Blue Iris Professional. 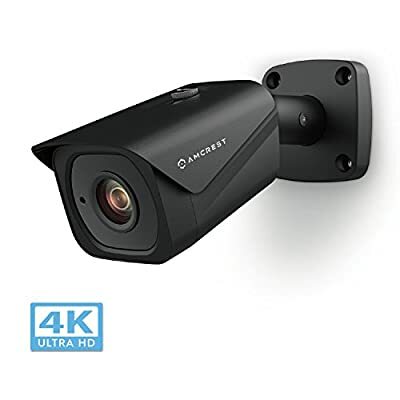 Features a Sony Starvis 1/2.5" 8MP progressive image sensor to achieve unsurpassed low-light capability and night-vision up to 131 feet. Works with Amcrest Cloud remote video storage, MicroSD, Amcrest NVRs, Synology and QNAP NAS & FTP. Works with Pale Moon (32bit) and SeaMonkey browsers, IE, Safari 11, Firefox 49.0 and Chrome with Amcrest Web View Extension. 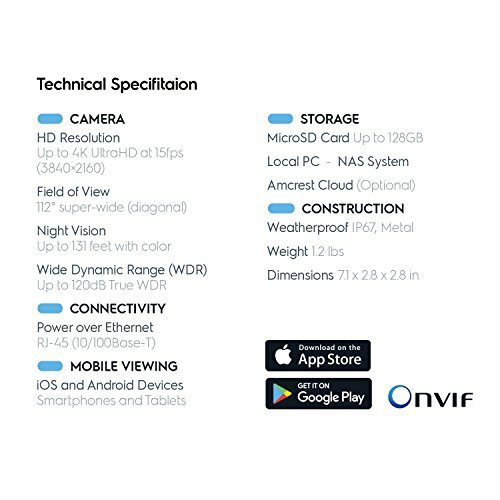 Heavy-duty metal IP67 Outdoor Weatherproof Camera. Dual H.265/H.246 compression allows for maximum encryption with the latest technology as well as backwards compatibility with legacy platforms. Operating Conditions: -30°C ~ +60°C (-22°F ~ +140°F) Less than 95% RH. Compatible with the following Amcrest Junction Boxes, ASIN: B07CB468HC, B07FK662Z5. POE power supply (injector or switch) required but not included. Bullet Dimensions: 6.9 x 2.7 x 2.7 inches. EXPERIENCE ULTRA HD 4K - Observe high-quality footage with a Sony Starvis Sensor progressive scanning image sensor, Ambarella Chipset and UltraHD 4K 8MP- resolution (3840x2160). A super-wide 112° viewing angle allows you to see more detail and cover more ground to keep more of what you love safe. 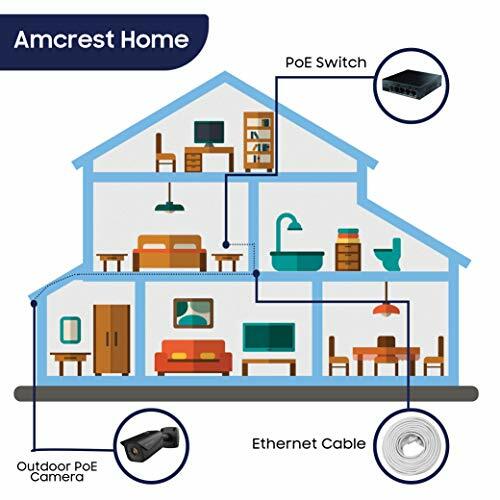 Power Over Ethernet (POE) for easy installation (POE injector or switch required; not included, sold separately) SMARTER, SAFER SECURITY - Utilize alerts that send notifications to your computer or smartphone via the Amcrest View app. Record events as soon as they happen and store them on a Amcrest NVR, Synology, QNAP, NAS, FTP, Blue Iris or Amcrest Cloud. Compatible with the following Amcrest Junction Boxes, ASIN: B07CB468HC, B07FK662Z5. 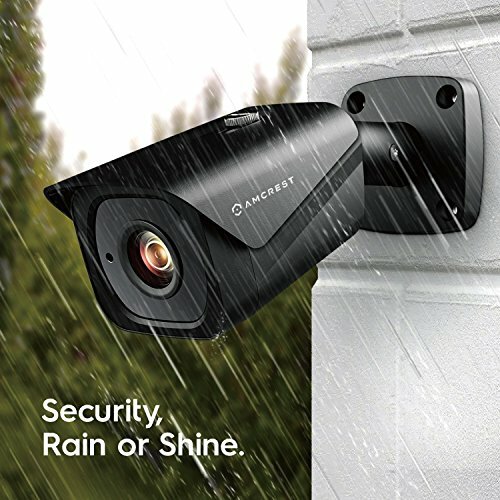 ALWAYS RESILIENT - Whether it's rain or shine, day or night, this 4K PoE IP Camera features heavy-duty, weatherproof IP67 housing. With IR night-vision up to 131 feet, you can keep the people and places you love safe 24/7. Always stay in the know by recording at specific times based on your preference. H.265 Compression technology allows for files to be compressed without any noticeable difference in quality. FIND SOLACE IN THE CLOUD- Amcrest Cloud was created to ensure that you don't miss a thing, no matter where you are. With an intuitive interface, you are able to live-stream your footage which enables you to play it back based on your preferences. Receive 4 hours of storage free with extra optional storage plans available for purchase. SIMPLE, RELIABLE, SECURE - At Amcrest, we want to ensure the safety of our customers, their loved ones, homes and businesses. You'll receive a full 1-year US Warranty and Lifetime Support provided directly from Amcrest.